CBSE 12th result 2018 will be available on the official website on 26th May 2018. CBSE will announce the Results on the official website on 10 AM Morning. Students can check their CBSE Class 12 result in 2018 after the official declaration. "CBSE Class 12 results for Academic Session 2017-18 to be declared on May 26," School Education Secretary Anil Swarup said in a tweet. In 2018, more than 28 lakh students had appeared for the CBSE Class 10 and Class 12 examinations. 16,38,420 students registered for Class 10 exam that was held at 4,453 centres all over India and 78 centres outside India. 12, 11,86,306 candidates had registered and the exams were held at 4,138 centres in India and 71 centres outside India. the Class 12th examinations were held from 5 March to 13 April, while Class 10th exams were held from 5 March to 4 April. 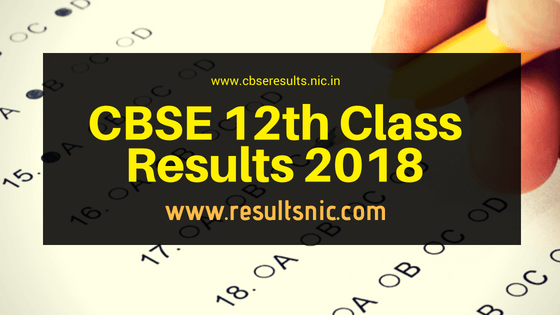 The official websites to check the CBSE 12th result 2018 are given below. The results are available after the official release only. There are some reports says that the result is also available on google.co.in. In 2017, nearly 11 lakh students, 6,38,865 boys and 4,60,026 girls appeared for the CBSE Class 12 exam. In 2016 nearly 10.67 lakh students written CBSE Exam. The number of centres and schools registered for the Class 12 exam were 3,502 and 10,678 respectively. In 2017, the topper was Raksha Gopal from Amity International School in Noida. The CBSE topper scored 99.6 percent, while the second topper Bhumi Sawant of Chandigarh scored 99.4 percent. Go to the official website cbseresults.nic.in. Click on the link 'Class 12 Exam Results' - this will be on the top of the list. Take down a print of the result for reference till you get the original mark list from CBSE.